Elliotts have been manufacturing and distributing gloves for over 40 years. We take care to ensure we offer our customers innovative, quality safety products they can rely on. Partnering with companies like TechTrade is what we do and the Pro-Tech 8 range of specialised gloves aligns closely with our strategy of offering world class, innovative, quality safety gear for all industries and applications. "We have been researching the firefighting glove market for some time, looking for a product or combination of materials that would enable us to offer something truely innovative to the firefighter. We were looking for gloves that provided high levels of dexterity, comfort and protection. Something not easy to achieve in a firefighting glove." 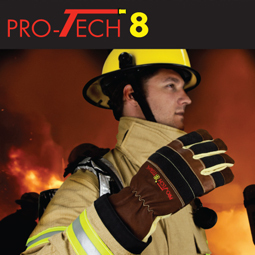 The entire Pro-Tech 8 range will be on display at the AFAC Conference in Sydney from the 29 August through 1 September, 2011. Pro-Tech 8 gloves are fast becoming the first choice of firefighters looking for high levels of protection and dexterity. To learn more about the Pro-tech range visit the Elliotts Stand at AFAC 2011 or online at elliottaustralia.com.